THE NEWLY APPOINTED CHAIRMAN OF RAJASTHANI BHASHA EVAM SANSKRITI ACADAMY, SHRI SHYAM SUNDAR MAHARSHI IS A SAMPLE OF SIMPLE LIVING AND HIGH THINKING. FIRST TIME I MET HIM IN 1985, AT THE ROAD SIDE IN AJMER. THAT TIME HE WAS THE STATE PRESIDENT OF RAJASTHAN QUANOONGO SANGH, & I WAS THE DISTRICT SECRETARY OF SRIGANGANAGAR. HE IS THE MAN, WHO ENCOURAGED FOR STRUGGLES; & INTRODUCED ME AT STATE LEVEL. HE WAS LIVING IN SRIDUNGARGARH AND I WAS IN SRIGANGANAGAR. LATER IN 1998-99 I WAS SADAR QUANOONGO OF THE CHURU DISTRICT AND HE WAS TEHSILDAR UDAIPUR WATI. IN APRIL 2010, I WENT FROM NAGAUR TO DUNGARGARH AND MET HIM. HE MET ME WITH THE SAME SMILE. HE ALWAYS GUIDED ME, AND MADE ME FEMILIER WITH THE WORKIN SYSTEMS OF THE BOARD OF REVENUE, AJMER AS WELL AS THE SECRETARIATE JAIPUR. 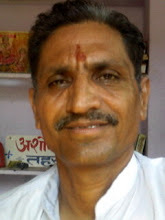 FROM VERY BEGAINING HE IS A PROMINENT WRITER IN RAJASTHANI. HE HAS FULL COMMAND ABOUT RAJASTHANI LITRATURE AND CULTURE. HIS APPOINTMENT AS THE CHAIMAN OF THIS ACADAMY IS PROUD FOR ALL THE RAJASTHANI WRITERS AND SAVERS OF THE RAJASTHANI CULTURE.